We began this process with the definition that gender justice exists when all people — especially women, girls, and gender-variant people — are able to identify and express their gender and sexual orientation without fear, discrimination or harm, and have the economic, social, and political power and resources to make healthy decisions for themselves, their families and their communities in all areas of their lives. It will require transformation at interpersonal, institutional, systemic and cultural levels. LGBTQ justice, reproductive justice and family security are three issue areas at the core of Gender Justice. Definition adapted from Western States Center and Forward Together. 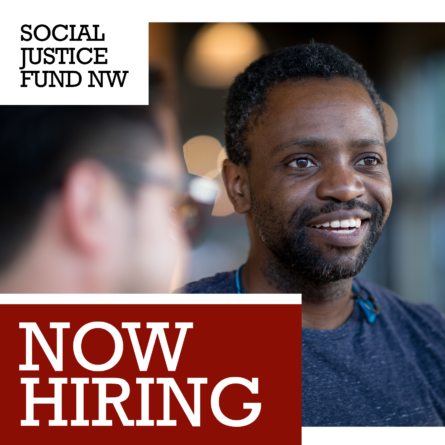 We’re incredibly proud to announce these new grants, specifically addressing gender justice across the Northwest. These grants are a result of a five month process led by our members, and participants of the 2014 Gender Justice Giving Project. 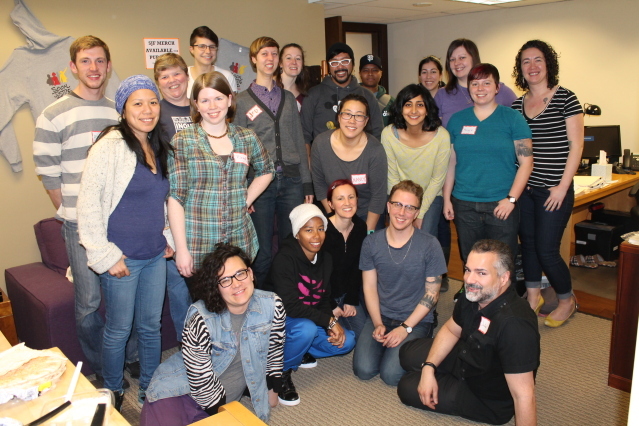 The 2014 Gender Justice Giving Project consisted of 19 multi-gender, multi-racial, cross-class volunteers who worked together to deepen their understanding of social movements, and explore the intersections of race, class, and gender in their own lives. Together they learned about community organizing, grantmaking, and fundraised for their Giving Project raising a total of $93,739. They also smashed all previous donor records by reaching over 350 donors – the most donors reached by a single Giving Project! Community to Community Development | Bellingham, WA: Community to Community Development (C2C) is a place based, women-led grassroots organization working for a just society and healthy communities. We are committed to systemic change and to creating strategic alliances that strengthen local and global movements towards social, economic and environmental justice. We believe that another world is possible and we are active participants with other popular people’s movements. We strive to reclaim our humanity by redefining power in order to end settler colonialism, capitalism, and patriarchy, in their external and internalized forms. We prioritize the analysis of women of color, and the actions and solutions proposed by the most directly-affected immigrant, farmworker, low-wage worker, youth, LGBTQ communities in rural Whatcom and Skagit counties. We cultivate deep solidarity relationships with sister organizations through larger regional, national and global coalitions that move social, economic, environmental, racial, and gender justice forward. Gabriela Seattle (formerly Pinay sa Seattle) | Seattle, WA: GABRIELA Seattle is a collective of Filipino women celebrating our multifaceted identities, revolutionary history and rich culture. We work to build a community in the Seattle area invested in educating, defending and advocating for the human rights of Filipinas all over the world. We were founded in 2006 by a group of Filipino American women in Seattle who saw the need to organize their community into a political force with an anti-oppression and anti-imperialist vision. Gender Expansion Project | Missoula, MT: The Gender Expansion Project’s mission is to promote gender inclusive education and awareness surrounding transgender, transsexual, intersex and gender diverse people through evidence based care, education, research, advocacy, public and private policy and respect in transgender health and wellbeing. We, as an organization, envision the future of the project bringing together diverse professionals dedicated to developing best practices and supportive policies and programs throughout Eastern Washington, Idaho, Montana, Wyoming and the Dakotas which promote health, research, education, respect, dignity and equality for transgender, transsexual, intersex and gender diverse people of the rural northwest and beyond. Momentum Alliance | Portland, OR: Momentum Alliance is a youth-led non-profit, with experienced coaches, whose mission is to inspire youth to realize their power individually and collectively and to mentor future social justice leaders. We have two programs, Student Alliance Project, our “pre-apprenticeship” leadership program and Leveraging Momentum, our “journey level” leadership network that support underrepresented youth to become our public, private and non-profit sectors’ next leaders, decision makers, advocates and organizers. This grant supports Reproductive Justice camps, development of reproductive justice analysis, curricula, and resources, and other ongoing reproductive justice work. Oregon Tradeswomen, Inc. | Portland, OR: Oregon Tradeswomen, Inc. is dedicated to promoting success for women in the trades through education, leadership and mentorship. TOOLS (Tradeswomen Organized for Outreach, Leadership & Support) is a membership driven program that mobilizes diverse tradeswomen’s leadership and activism skills to advocate for quality, safe, and equitable workplaces and communities. 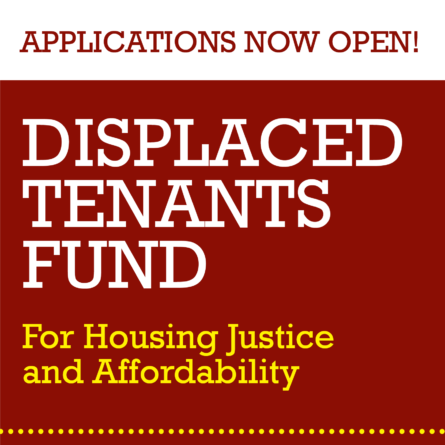 This provides an avenue for tradeswomen, OTI, and community allies to directly combat institutional and systemic barriers in the building trades, address racial and gender equities in the trades, become engaged citizens, and fight for gender, racial, economic, environmental and social justice for all. PFLAG Portland Black Chapter | Portland, OR: Portland’s African-American/Black PFLAG (Parents, Families and Friends of Lesbians and Gays) chapter promotes the health and well-being of gay, lesbian, bisexual and transgender persons, their families and friends through: support, to cope with an adverse society; education, to enlighten an ill-informed public; and advocacy, to end discrimination and secure equal human rights. PFLAG provides an opportunity for dialogue about race, sexual orientation and gender identity, and acts to create a society that is healthy and respectful of human diversity. Q/TPOC Birthwerq Project | Seattle, WA: The Q/TPOC Birthwerq Project is a collective of queer and trans* people of color (Q/TPOC) committed to continuing a reproductive justice movement that is grounded in its roots within poc communities and is skilled at supporting transgender and queer people. We define RJ as when all people have the social, political, and economic power and resources to make healthy decisions about our gender, bodies and sexuality for ourselves, families and communities. This grant supports an ongoing cycle of workshops and facilitated circles to teach and share about labor support, reproductive justice, and trans-competent pregnancy support for q/tpoc communities across the U.S. Our focus will be on cultivating reproductive awareness and skill in poc communities, with an emphasis on queer and trans experience. WHEEL | Seattle, WA: WHEEL is a grassroots organizing effort of homeless and formerly homeless women working to increase dignity, safety and resources for homeless women and to advocate for systemic changes towards ending homelessness. We formed in 1993 to advocate for more shelter and safety for homeless women in an empowering and dignified way that engaged women in creating and operating programs to address their own problems. WHEEL’s mission hasn’t changed but our work has grown and diversified with many more projects to engage a larger and more diverse group of women and to meet more women’s specific skills and strengths. Our vision is empowerment through social engagement. WHEEL gives voice and empowerment to women to engage them in creating and changing programs to fit their own needs. We know that the people affected by a problem must be involved in the solution. Women Restored | Fort Washakie, WY: Women Restored is a community education, engagement and awareness organization. This includes but is not limited to: Seeking to end sexual and physical violence against women and children, and all violence; strengthening community attitudes on the traditional sacredness of women, children and all life; revitalizing culture and a healthy identity; fortifying tribal self-governance; enacting restorative justice practices; reinforcing kinship ties and dignity of every community member that includes self-determination; supporting safe, healthy, and happy families as our ancestors intended for us; and practicing the values of our Shoshone and Arapaho grandmothers and grandfathers so that they may live on through us and in future generations. This grant supports work to support empowerment of two-spirit youth and community members within the Wind River Indian Reservation and prevent gender violence. We will organize to create space for this target population to gain equitable power and resources by changing community norms and attitudes through research, strategic culturally-relevant social marketing campaigns, raising the visibility and skills of two-spirit allies, and creating meaningful leadership roles for more two-spirit youth and individuals within our organization. 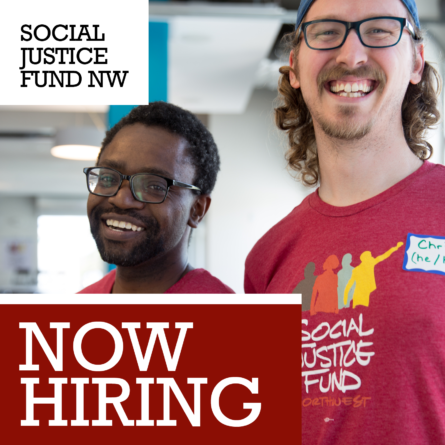 Our first-ever Gender Justice Giving Project began March 8, 2014 and came to a close August 13 with a total of 9 new grants to organizations working toward gender justice across the Northwest. The Gender Justice Giving Project is group of 19 volunteers who worked together as a a multi-gender, multiracial, cross-class group to explore and deepen their understanding of their framework in social movements, and in their own lives. Together they learned about community organizing, grantmaking, and fundraising. This group raised $91,704, and smashed all previous donor records by reaching 343 donors – the most donors reached by a single Giving Project! They approached the challenge of decision making with integrity and respect for the grantees, the process, and each other.